CHICAGO (CNS) — The brides gathered at the back of Immaculate Conception Church in Chicago complimented one another, adjusted their veils and kept their eyes on the small children who darted around their skirts before lining up for the entrance procession. The grooms, fidgeting in a room next to the sacristy, cracked nervous jokes and waited for the signal to take their places in front of the congregation. All told, nine couples — all of whom have been civilly married for years — participated in a recent “community wedding” at which their marriages were convalidated by the church. Civil ceremonies confer the legal benefits of marriage, but by receiving the sacrament of matrimony that day at Immaculate Conception, the couples were brought into full communion with the church, allowing them to receive the Eucharist. Such convalidation ceremonies take place in dioceses all over the country, many in the immigrant community. In the Diocese of Raleigh, North Carolina, William Cardona-Arias, coordinator for Hispanic Lay Leadership and Family Life, told Catholic News Service that 150 couples who wanted their marriage convalidated participated in 12 marriage preparation workshops he and his wife, Andrea Blanco, conducted in Spanish from January to December last year. In the Diocese of Arlington, Virginia, marriage preparation classes also draw many couples who have been civilly married and are seeking to be married in the church. According to the diocese’s Spanish Apostolate, the majority of those couples come from countries where civil wedding ceremonies are more common than church ceremonies. Often, church ceremonies in their native countries cost too much or couples do not feel it is necessary to have a church ceremony, said Father Jose Eugenio Hoyos, director of the apostolate. 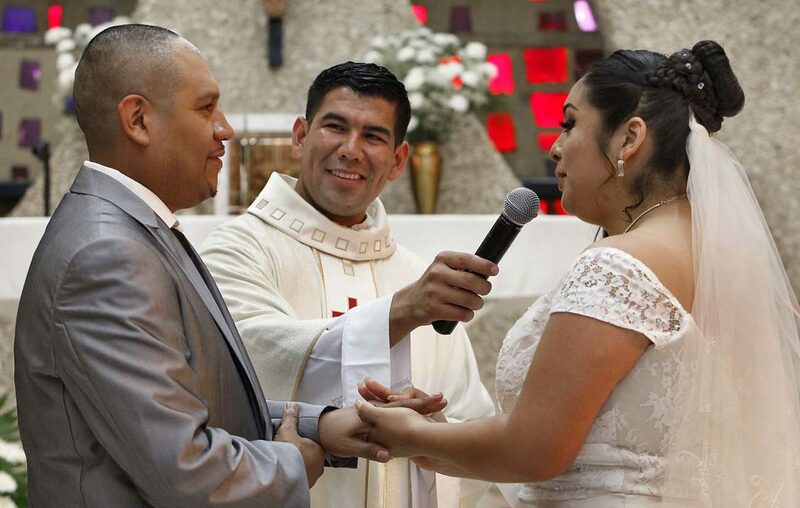 When these couples are invited to receive the sacrament of matrimony, Father Hoyos said, many tell him they would be happy to just have a blessing. But he explains to them it is more than a blessing, that the convalidation ceremony makes them full members of the church. Some also wrongly think such a ceremony “will be very expensive,” the priest added. “It is not just a bandage,” he said of the convalidation ceremony, which could include 10 to 20 couples. “We make them feel they are welcome in the sacraments and the church.” The ceremony also is family-oriented, he added. The ceremony is “so beautiful,” Father Hoyos said, and also is “a good example of love” for any children in attendance. In some parts of the world, there are fewer church weddings because of a lack of clergy, like in the Dominican Republic, where Father Creedon was the first priest to serve in the Arlington Diocese’s mission there. He added that some couples want their marriage convalidated because they want to be godparents. Holy Family usually has six to eight couples “celebrate their marriage together,” he said. The ceremony integrates them into the church community, too, besides bringing them into full communion with the church. In Chicago, Father Manuel Dorantes, pastor at Immaculate Conception, raised the idea of a community wedding because he was aware that a number of couples in his parish had civil marriages but had not been married in the church. The couples took the wedding ceremony seriously — with wedding dresses and flowers and a party and their families around them. “I think the celebration is tied so strongly into the idea of the sacrament in this culture, as it is in every culture, I think,” Father Dorantes said. Each couple contributed — and other people donated — to help cover the cost of a photographer and videographer and a reception. The idea went over so well that the parish had to schedule two wedding Masses. Navarro and her husband have three children, who were “all excited for us,” she said. During the nuptial Mass, each couple came forward to pronounce their vows and exchange their rings. The rite included several Mexican traditions, such as the customary gifts given by the couples “madrinos” and “padrinos” –-a type of sponsor who filled the pews in the front section of the church. Having gone through marriage preparation together, the couples became friends and have been a source of support to one another, they said. After the Mass, the couples took photos in front of the altar and regrouped with their families. Eloisa and Luis Orozco, together 18 years, married civilly 16 years and married in the church that day, smiled broadly at their three children, Fernando, Alysie and Aylin. “I feel great,” Eloisa Orozco said. Martin is a staff writer at Chicago Catholic, newspaper of the Archdiocese of Chicago. Contributing to this story was Julie Asher in Washington.